With beauty, brains, and the love of flight, Hannah Hunhoff has been bitten by the aviation bug. When I meet young people like Hannah, with a history of aviation in her family, I have to wonder if this passion is more than a bite, but flowing in their blood. 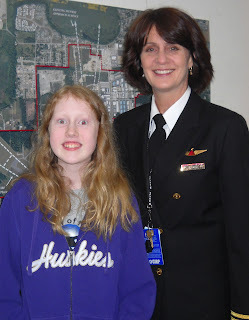 I first met Hannah at Renton Airport at a Fly It Forward event with her Dad, Joe. 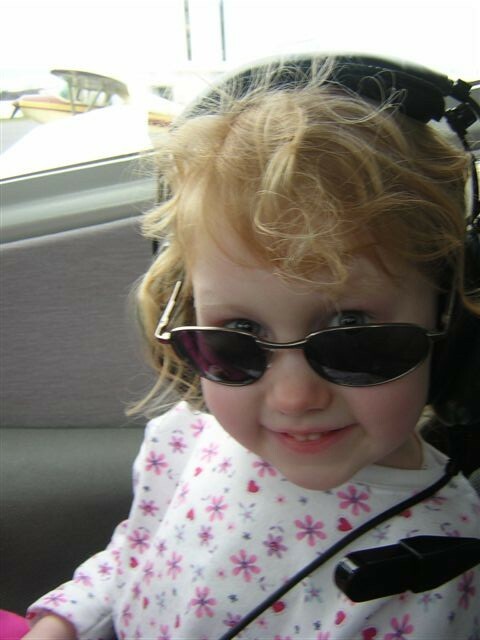 Hannah's dad say's, "She certainly has all the resources surrounding her, but most notably the inclination and the following drive to be a pilot. We recently took a day off of school when I took her down to the Museum of Flight where she attended the "Women Fly" conference by herself for the day. Following that, I took her to see her uncle at Galvin where we got an up close tour of the airplanes. He finished up with giving her a nice pep talk, instruction and an hour of flying time in Galvin's Diamond DA42 simulator... successful at everything - first time around! It was a wide eyed day." To date, she has 1.5 hours of stick time, logged in her very own logbook, thanks to Cathy Mighell's Out of the Blue Aviation Summer Camps. I had the opportunity to meet Cathy one evening when I drove up to Arlington to speak to a group of aviation enthusiasts at Out of the Blue about my career as a pilot. Who should be there but my friend Hannah. “That’s not entirely true. I wouldn’t expect him to know what happened exactly because I don’t tell very many people how it happened in detail. On a random day, we decided to go to the Museum of Flight. We went out to go see the Concorde out in the airpark. I thought “Wow! What an interesting plane! I would love to study it!” So I did. Learning about the Concorde inspired me to aviation. I again thought “Hmm. If this plane is very interesting, I’m sure there are more cool planes out there!” So I looked at many others. I learned more and more about planes and I thought they were very cool so I was an aviator. My uncle Chris Hunhoff is the chief pilot at Galvin Flying near the museum. He inspired me to be a pilot. When I took a flight with him when I was four, It was pretty fun. I remembered it was very fun! I wanted to fly planes myself. When I saw the Concorde was January 02, 2010. How I remember this is I took a few pictures and they had the date on when they were taken. Otherwise, I would have never known when this happened. Moving along to the B-17, I first saw it on memorial day 2010. Can’t remember exactly what day of the month that was. But I got to look around inside the aircraft. Strangely, I don’t really remember much of it. Only that it was raining, haha! But soon, I’ll get to see it again and I’ll engrave the memories into my brain. My dad told me about the movie “Memphis Belle." If you haven’t watched it, It’s a truly amazing movie! I recommend it! And it sounded interesting. The plane starring in it was a B-17. That movie gave me an idea on how they were used in war. I found it interesting. From the Wright brother’s first flight, all the way to tomorrows advanced designs, I’d say my favorite era of aircraft is from the 1939’s to the 45’s. I am interested in WWII Aviation the most. Not so much on modern. I love how the planes sound, look and more! The P-40 and the B-17 are my 2 top favorites. I like many more but those two are my absolute favorites." A few years ago Joe and Hanna happened to be at the Museum and the B17 was offering tours and flights on that day. They only managed a tour for Hanna that day, but watched the schedule and learned that the Liberty Bell would be back again, and when the crew heard Hannah's story they were sure to put her on the first flight of the day and give her an opportunity in the cockpit too. Last weekend I drove down to Boeing Field, at the Seattle Museum of Flight, to watch Hanna take to the sky in the Liberty Belle! She was one of the first nine guests to take a morning flight. Christine is currently working on her instructor's license, too. I have no doubt she and Hannah will one day fly together. And I'm looking forward to the day the above picture will be taken again when all three of us are flying a line flight, together. 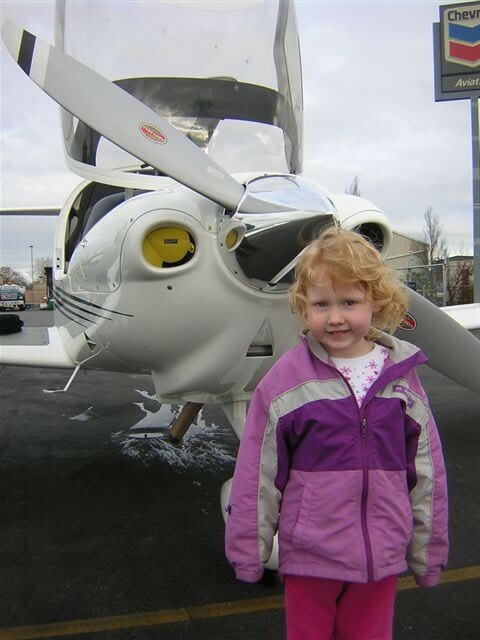 Hannah's aviation journey is definitely a family affair. One day she'll look back and realize how fortunate she was to have the support and encouragement of her family, sharing a passion together. Sharing her passion. Hannah is flying forward at fully speed. Keep that passion alive Hannah. All your dreams are coming true. Join me here next Tuesday to meet details and photos of her aviation family. Aviation History at its best! Hanna definitely seems born to fly. Lucky girl, and not just because she has the opportunity, but because she has the passion. That's clear, and that's what will pave her path into her future. Love the story, thanks, Karlene. Awesome article! Keep it up Hanna! Follow your dreams and your heart. Flying is amazing! I'm hoping to start my daughter off early as well! She's 6 and constantly bugging me on when I'll take her up in a little plane. Wow! her family and her passion is amazing!! they are definitely fabulous flyer. thanks for sharing, Karlene san. Best of luck to Hanna in a career in aviation. I admire her drive! Linda, you are so right! It's all about the passion. Some people never find it. Thanks for your comment! Andrew, I don't think you can start her too late. Maybe we can make her a Friday Flyer too! Jun, one day you will talk to her! And, maybe you'll both be flying your planes across the ocean Thanks for your comment! Thank you for your comment Heather. Drive she has. Just like you! And... with that she will accomplish anything. Christine... one flight at a time. You're doing great! Argh! I'm so jealous! She got a ride in my favorite old plane. Next time your favorite old plane comes to town... let's take a flight in her! Hannah: Keep following your dreams and great things will continue to happen. There is almost no limit. Thanks for the comment Andy. But... "Almost"??? lol. I'm thinking I don't like that A word! Thanks Captain Yaw for the great comment. I think she would have a great time with the girls in Ganah. And... not sure if she's going to Oshkosh this year... but hope we all will meet there! Christine Hollingsworth Friday’s Fabulous Flyer! Medicine on the Move... Coming to the U.S.
Today! Live the Dream and FLY!!! Juliet Kuruwaa: "Why I Want To Fly"
Want to Fly for DELTA?